Dates associated with the GSTR-3. Prerequisites for filing the GSTR-3. The GSTR-3 is a document containing the details of all transactions during the month, including purchases, sales, and interstate movement of stock for a particular month. This return is auto-generated based on the information available inside the GSTR-1 and GSTR-2 that have been filed for the same tax period. GSTR-3 of a particular month must be filed before the 20th of the following month. For example, if you want to file GSTR3 for the month of July, 2018 then you need to file it before the 20th of August, 2018. Note: The council has relaxed the GST return filing dates for the first few months till December 2017 to facilitate the transition into GST. GSTR-3 for July, 2017 has to be filed on or before 10th November 2017 (Information sourced from CBEC). The last day to file the GSTR-3 for August 2017 is yet to be announced. You must be a registered tax payer under the GST with a 15 digit PAN-based GSTIN. You should have filed GSTR-1 and GSTR-2. Very Important! You have to pay the tax (GST) you owe for this month to the government before filing this return. This information can be found inside your GSTR-3 summary that can be generated inside your GST portal even before filing your return into the GSTN. 1. GSTIN: Your unique PAN-based 15-digit Goods and Services Taxpayer Identification Number. a. Registered person’s legal name. b. Trade name, if any. Taxable Turnover (excluding turnover from zero rated items). Zero rated supply on payment of Tax (this refers to all those exports, deemed or otherwise made without a Letter of Undertaking. Because of this, the exporter is liable to pay GST on goods and services exported and get it refunded back to them at a later point). Zero rated supply without payment of Tax (this refers to exports made along with an LUT aka Letter of Undertaking which gives an exporter the ability to sell goods overseas/to SEZ units without charging GST). Turnover from deemed exports (deemed exports are items sold to overseas customers and specialised units but the goods don’t leave the country). Turnover from exempted supplies (these are items and services which do not attract GST but you can’t claim refund on tax you paid on input services and goods that were used to render them). Turnover from Nil-rated supplies (these are items which attract 0% GST but you can claim refund of tax you paid on the input goods and services that were used to create them). Turnover from non-GST supplies (these items and services are outside the purview of GST and may attract local taxes like state VAT). 4. Outward Supplies: All sales and supplies you made to your customers. The data under this section can be generated automatically using the data that you have recorded under the GSTR-1. 4.1 - Inter-State Supplies: Net supply for the month, including taxable supplies, supplies made under reverse charge, zero rated supplies made with payment of IGST, and online sales through an e-commerce channel/operator. 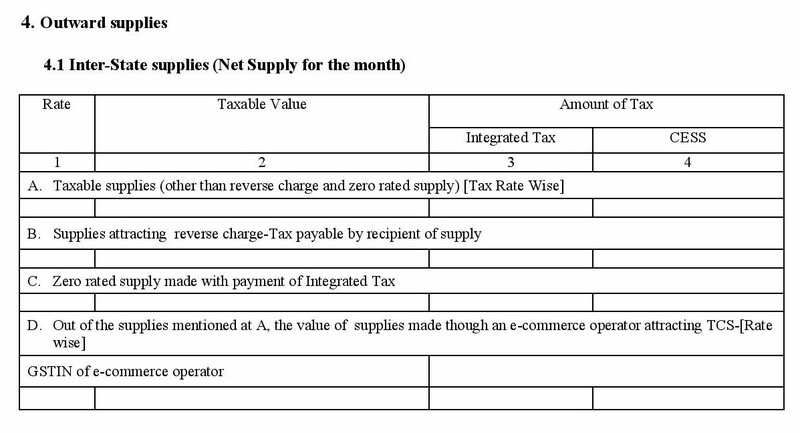 4.2 - Intra-State Supplies: Net supply for the month, including taxable supplies within the same state (with or without reverse charge) and online sales through an e-commerce channel/operator. 4.3 - Tax effect of amendments made in respect of outward supplies: This section captures change in tax liabilities (the tax amount you need to pay to the government) and tax credits (the amount that will be refunded back to you) due to modifications made to invoices and other sales documents issued by you for this month. 5. Inward Supplies attracting GST on reverse charge: All purchases and supplies you received from your vendors during this month where you pay GST directly to the government on behalf your vendors. This data will be automatically generated using the data from your GSTR-2. 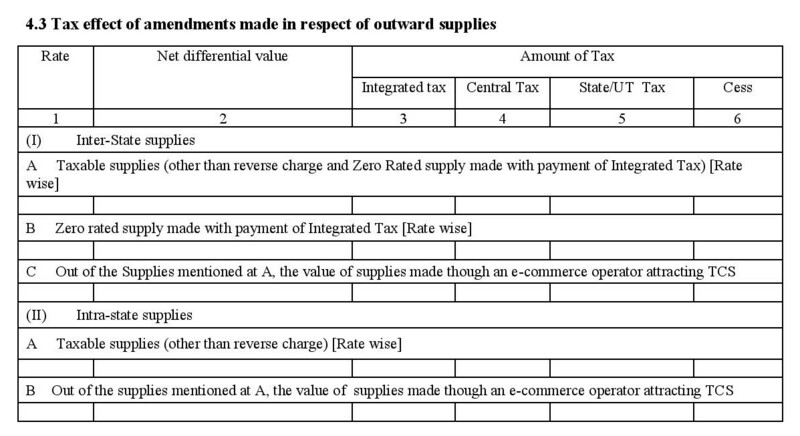 a. Inward supplies on which tax is payable on reverse charge basis (both inter-state and intra-state). b. Tax effect of amendments in respect of supplies attracting reverse charge: Whenever you modify the amount on your purchase documents, the ITC you get from those transactions also changes. This inturn affects the amount of tax you owe to the government and the government has to either collect any excess amounts that are pending or refund the excess tax paid by you. The data under this section enables the government to do that by keeping track of every change in your tax liability that arise due to modifications made to purchase invoices given by unregistered vendors (for which you paid tax on reverse charge basis). 6. Input Tax Credit: The tax you paid on inward taxable supplies (including imports) will be given to you as credit by the government as soon as you receive an invoice against a purchase from a vendor. This credit can be used to reduce or offset the amount of tax you have to pay against the sales that you carry out. This table captures all your ITC including those received from ISD. It also captures the summary (net total) of all debit notes and credit notes received during the current tax period. ITC claimed on mismatched or duplication of invoices or debit notes. Tax liability on mismatched credit notes. Reclaim on rectification of mismatched invoices/Debit Notes. Reclaim on rectification of mismatch credit note. Negative tax liability from previous tax periods. Tax paid on advance in earlier tax periods and adjusted with tax on supplies made in current tax period. 8. Total Tax Liability for the month: Upon providing the details of sales and purchases for this month, the GSTN will calculate the tax that you have to pay for the month under CGST, SGST and IGST, and display that data here. a. Tax liability on outward supplies: Tax you have to pay to the government on items and services sold by you including interstate stock transfers made this month. b. Tax liability on inward supplies under reverse charge: Tax you have to pay to the government on behalf of purchases made from unregistered suppliers. c. Tax liability due to ITC reversal or reclaim: This data is sourced from Table 11 of GSTR-2. d. Tax liability due to mismatch, rectifications and other reasons. This is obtained from table 12 of GSTR-2. a. TDS credit received during the month: Details of all the transactions where you have deducted tax at the source, fetched from the GSTR-2 and the GSTR-7. b. TCS credit received during the month: If you are an e-commerce seller, then any Tax Collected at Source(the 1% TCS on the amount paid back to you) collected by your e-commerce operator on your online transactions is listed here. This data is fetched from your GSTR-2 and the GSTR-8 filed by your e-commerce operator. 10. Interest liability: Total interest you owe to the government for various reasons (on account of mismatches in tax liability, ITC claimed, ITC reversal or delay in tax payments or filing returns). 11. Late Fee: Any late fees to be paid under different tax heads (central, state and union territory GST). This section has to be manually filled by you while drafting this return. To complete the data under tables 12 and 13, you need the information on your tax payment receipts. 12. Tax payable and paid: Here you are required to document the tax that you are supposed to pay under different tax heads (as known as tax payable under IGST, CGST, SGST or UTGST and Cess). This can be obtained using the data on your GSTR-1 and GSTR-2 or from the tax reports on your accounting software. Under GST, you can pay tax in two ways, you can either pay it using money (Paid in cash) or you can use the credits that you have under various tax heads against the tax you paid on purchases to offset it (Paid through ITC). The final column will hold the total tax that you have paid under various tax heads for this month. 13. Interest, Late Fee and any other amount (other than tax) payable and paid: These are penalties levied by the tax authority on taxpayers who fail to comply with the GST law and are separated by type of tax and tax heads. This will apply to you only if you broke the GST law at some point. 14. Refunds Claimed from Cash Ledger - Under certain circumstances, if the tax that you owe is less than the projected amount, then the difference between the two will be refunded to you. You can find the details of such instances under this section. 15. Debit entries in electronic cash/credit ledger for tax/interest payment - This section will be automatically filled in once you pay taxes and submit your returns. Last but not least, before filing the GSTR-3 return, you have to sign and authenticate the return either through a digital signature certificate (DSC) or by using an Aadhar based signature verification mechanism. A GSTR-3 filed without discharging the complete tax liability (the tax you owe to the government) under Table 9 will not be treated as a valid GST return. If you have declared your tax liability incorrectly while filing GSTR-3, it will get rejected as an invalid return. However, this can be corrected by updating and filing the Part B of the GSTR-3 once again. That said, it is still unclear as to how this can be done at this point of time. Refunds from a cash ledger can only be claimed when all the return-related liabilities for that tax period have been discharged. Such a claim will result in a debit entry being added to the electronic cash ledger.